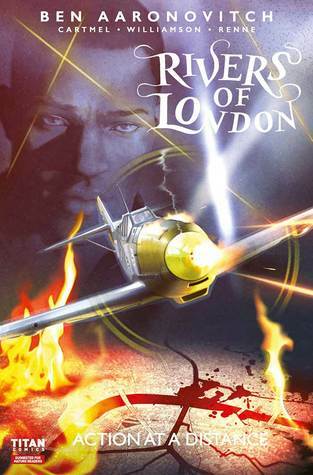 Rivers of London begins a new story from creator Ben Aaronovitch. The secret history of Nightingale is revealed for the first time, as wizarding cop, Peter Grant uncovers his mentor’s occult service in World War II! Finally starting to get some details on Nightingale. Only a little but very satisfying. Nightingale magics WW2 This series starts with a bang, almost literally, as master magician Thomas Nightingale drops a Nazi fighter plane from the sky with a flick of his hand.. It also introduces old comrades, including a possible earlier incarnation of ghost chasing dog Toby. I love seeing Nightingale do his stiff- upper- lip, old fashioned British magic. After all, one doesn't need to show off. This series has such depth of character and love of history (not to mention architecture, spicy food, Nightingale magics WW2 This series starts with a bang, almost literally, as master magician Thomas Nightingale drops a Nazi fighter plane from the sky with a flick of his hand.. It also introduces old comrades, including a possible earlier incarnation of ghost chasing dog Toby. I love seeing Nightingale do his stiff- upper- lip, old fashioned British magic. After all, one doesn't need to show off. This series has such depth of character and love of history (not to mention architecture, spicy food, and jazz). Been Aaronovitch can tell by kind of story he wants --- and keep new episodes coming! Another installment in the graphic novel series in the PC Peter Grant world -- this time, we're delving into the past for a story of a practitioner who is a serial murderer (but aren't they all?). Quick read - great illustrations - will reread later on my tablet. The first of another chapter in Peter's mini-adventures. I keep wondering how they're going to keep coming up with ideas for these that don't impinge on the territory of the main series, but they still manage it - adding depth to the characters or providing little vignettes of life at the Folly. The archives are opened to reveal a story line from Nightingale's past.... followers will be eager for more. A graphic novel placed in between the regular Rivers novels. Gives us some back story on Nightingale. I love catching glimpses of Nightingale's history.